My current residence is actually about 5 hours away from Austin deep within the East Texas Piney Woods in Longview, Texas (off of Interstate 20, about 2 hours east of Dallas or 1 hour west of Shreveport, Louisiana). I have been in Longview since 2010, but I consider myself a remote Austinite for the time being. 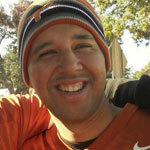 Currently, I’m an Assistant Director of Admissions for The University of Texas at Austin (HOOK ‘EM HORNS!! ), where I manage the University’s undergraduate recruitment efforts out in East Texas as the Director of the UT Austin- East Texas Admissions Center. However, because my organization’s headquarters is in Austin on campus combined with strong ties to Austin through family, friends, colleagues, and Longhorn football, I find myself in Austin quite a bit. I am a devout, passionate Longhorn alumnus with football season tickets since fall of 2006 and a significant burnt orange wardrobe for all situations. A lot of my networks online assume that I have never left; they often forget that I do not live in Austin, and it is funny when I have to remind them. What can I say? I do a great job! Since I advocate attending The University of Texas at Austin and living in the city of Austin to the public in my professional career, I could not imagine being more excited to talk about Austin through another great activity, running. If Steve here would have given Austin, Texas to another amigo in this project, I would have been livid. So, thanks Steve! Unlike for Steve and many of you that may be reading, running is a somewhat new fitness activity that I embraced just at the beginning of this year as I have always been more about weight training and swimming/elliptical machines every once in a while for cardio. Once I bought an updated pair of good running shoes from Run-Tex in Austin, I used the Couch to 5K running program earlier in the Spring to really build up my stamina and endurance. Just completing that program is a major breakthrough for me. Growing up, I suffered from asthma and would experience terrible reactions as a result of just even running a mile, starting in elementary school. After years in elementary school having to go daily to the nurse to use my inhaler after recess, activities like running were not aligned with what I considered fun. But now running serves as a strong life preserver. In 2000, at the age of 19, I was diagnosed with having non-insulin dependent diabetes due to genetic factors. At first, I thought the world was ending and was quite woeful about my diagnosis. But, I was forced to learn about nutrition, adopt a healthy lifestyle and healthy habits, or accept a shorter life span as my body would deteriorate much quicker from complications from bad choices and/or not caring. Losing a leg and going blind? NO THANKS! I see having this chronic condition as a blessing in disguise because I am way more conscious about what I do to my body now than I was before that time. When I decide to tell people about my diabetic condition, they are shocked because I have always maintained a good weight and have never been considered overweight. I always have to remind people that diabetes is a metabolic disease that could happen to anyone, regardless of weight or appearance. It is an issue of the pancreas, people! There are plenty of people in our society that eat the most unhealthy diets, but their pancreases can still handle that diet a lot better than others, and some are fortunate to never become diabetic. Now that I am “dealt this hand” in life, strength training and cardiovascular fitness as well as a proper diet, regular meal times, testing blood sugars, and adjusting medication as needed are crucial to sustain being non-insulin dependent as long as possible. It has worked for me for 12 years so far! The key, (from several years of food experiments/ testing ) is that I can eat anything, but only in portions relative to the time of day and how much exercise I will be doing that day and when that exercise period and the meals are going to occur. As long as I am in a symbiotic balance with nutritionally conscious choices, consistent, varied exercise, and great results from quarterly laboratory tests, I can even consume alcohol on weekends as a reward to myself with no issues. I love a good beer, whiskey, or dry red wine! East Texas, in my opinion, does not give an environmental advantage for a fitness-oriented person like a cognizant diabetic as opposed to living in Austin. 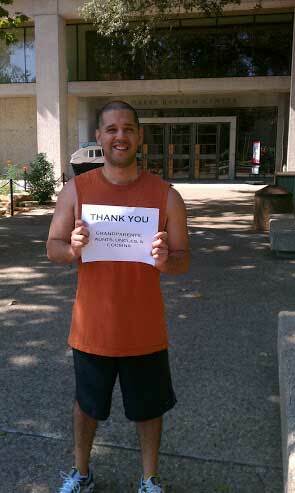 Granted, while there are running trails/races, gyms (shout out to FLEX GYM! ), and healthy people in Longview, the culture in Austin is comparably stronger by having a much more significant emphasis on wellness, healthy lifestyles, and being active outside. There are many gyms, boot camps, personal trainers, and health/fitness events in Austin that are as numerous as the amount of indie coffeehouses where they loathe Starbucks, BBQ joints, and Tex-Mex cantinas vying for your personal #1 ranking of the best frozen margarita in Austin. In addition, healthy food options are so much more abundant around Austin’s well-known local restaurants and there are grocery stores like Whole Foods Flagship, Central Market, or Wheatsville Co-op that specialize in organic foods and particular foods for certain diets. As I type this, I am craving a shot of wheatgrass and a breakfast taco made with a whole wheat tortilla, egg whites, and turkey bacon…well, maybe not the wheatgrass. In the 9 years I was an Austinite, I lived in central Austin where there is always a lot going on, especially for the young professional. Therefore, I am very excited to take you through a unique 6 mile route that I ran which highlights landmarks in my three favorite areas in Austin, The University of Texas at Austin, Downtown Austin, and South Congress Ave or Soco. Austin is in the “Hill Country” of Texas which means that for runners, you will go up and down quite a bit of hills of varied lengths and grades, and there are plenty on this route. 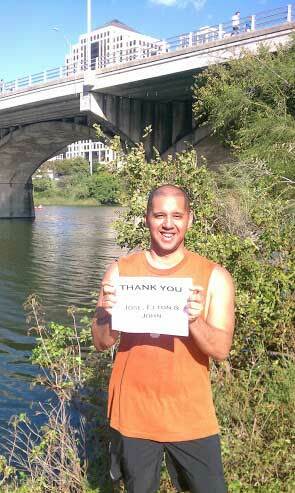 If you love running hills, you will love Austin; if you do not, there is a distinct alternative trail coming up ahead. 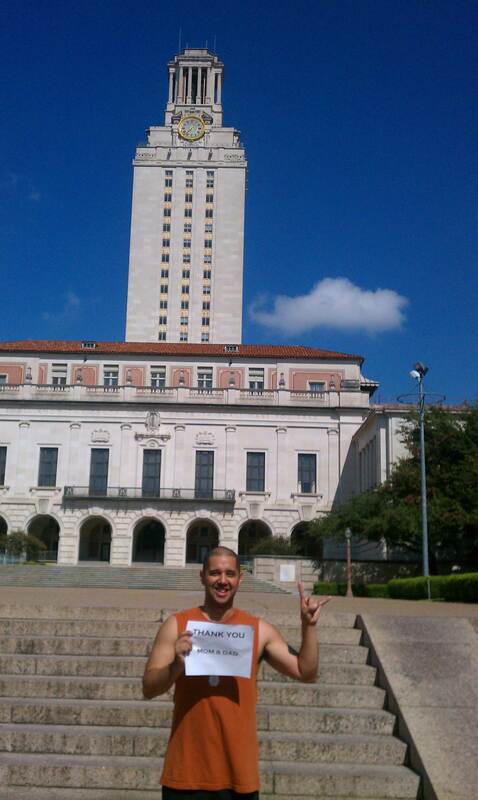 Behind me is the majestic Tower at The University of Texas at Austin, the start of the route which is also known as the Main Building. The Tower was first built in 1937 by Paul Phillipe Cret in Philadelphia to originally serve as the reserves for the University’s growing library collection. It is 28 stories tall, (30 if you count the carillon room) at 307 feet. 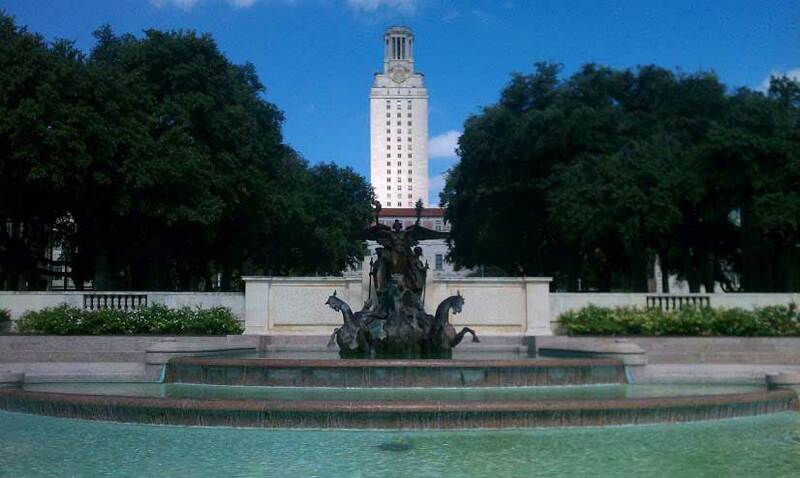 Over the decades, it has remained as a concrete symbol of the grandeur, academic excellence, opportunity, and pride of The University of Texas at Austin. There are 56 carillon bells which is the largest carillon in Texas and they are played by student carillonneurs throughout the week. Usually at night, it is all white, but due to specific academic/athletic victories or specific events, the lighting of the Tower can change, and serves as a communication beacon throughout the city of Austin. The observation deck was closed for a significant amount of years from the 1970s through the late 1990s and it reopened to the public my freshman year (Fall 1999) which was a huge day on campus. Now visitors can go up to the top and get a fantastic view of Austin by taking a Tower Tour. The best time to go is the last time slot they offer it during the sunset. Sometimes it can be closed due to events affecting homeland security, so it is best to call ahead to the Texas Union to check scheduling. It is appropriate that here at this majestic symbol, I would like to thank my parents for setting a great foundation and for all they have done for me, and for teaching me life lessons in spirituality, family, leadership, education, work ethic, respect, love, and passion. The second stop took me a little westward from the Main Building to Guadalupe Street or where Austinites and the UT Austin community calls “The Drag”. The Drag is considered off-campus, but it is the western border. On the Drag, there are several food places, restaurants, coffee houses, boutiques, retail stores, and places to hang out. It is always bustling on the Drag, particularly during the school day and on weekends. I happened to stop to show the Renaissance Market as there are always jewelers and craftspeople selling items to people. 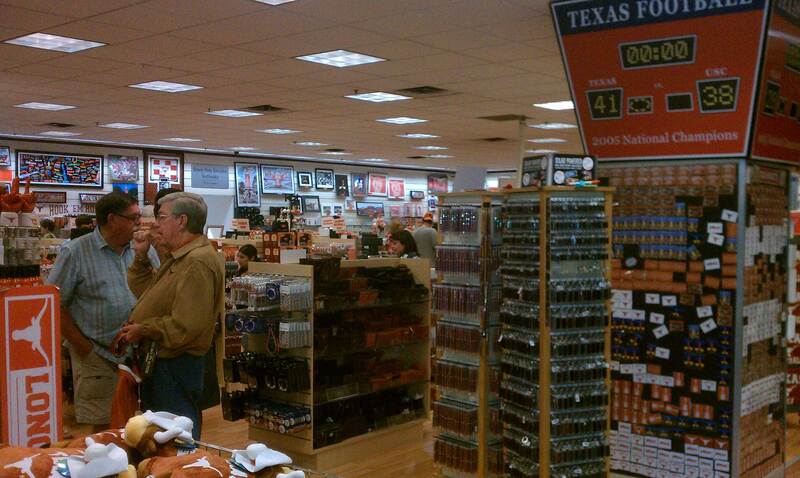 On the Drag is the infamous University Co-op where you can literally find anything that has a Longhorn logo on it from cat jerseys, poker tables, and Longhorn brand irons for grilling hamburgers to your typical t-shirts, hats, and glassware. It is three levels and the bookstore and academic supplies are actually underground. Between the parking garage and the actual store is the very large burnt orange Longhorn statue which is a great spot for photo-ops. Here I would like to thank my sister Analisa for being a great sibling and very supportive. She is the one person who understands me and my origins as we grew up in the same environment; I am proud that she and her boyfriend Josh have excellent careers out in Colorado now. As we both get further into our adulthood, I am glad I have her by my side through life’s journey. I went south on Guadalupe and turned right heading west on 22nd St. West of Guadalupe is what is considered the West Campus neighborhood, home to a good portion of UT Austin’s student population and Greek system. There are plenty of good blocks to run and there are a few hills, the closer you get down towards Lamar. In between a lot of older rental homes that house students are new high rise apartments and condos that have sprouted up over the last 5 or so years. This picture is pretty common is in West Campus, downtown Austin, and parts of East Austin: a new construction housing project and cranes. I decided to turn left heading south on Nueces to visit 1904 Nueces, the home of the Texas Beta chapter of Phi Delta Theta Fraternity. 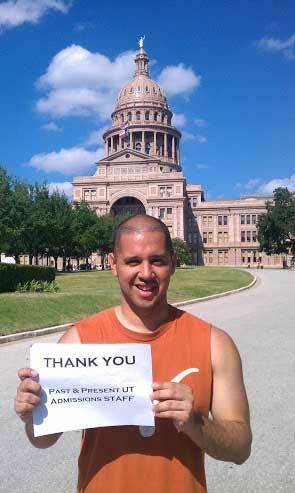 Here I would like to thank the chapter and in particular, the men in Texas Beta between 2000-2004. While I made plenty of friends throughout my time as an undergraduate at UT Austin in several organizations, it was my fraternity experience and my chapter brothers that I shared that with that really taught me a lot of life lessons that I carry into my personal and professional career today. My term as chapter president there in the 2002-2003 academic year was the pinnacle in my undergraduate career at UT Austin and such a profound year in my life, and I enjoy the times that I am able to reconnect at functions in Austin now. Whenever a lot of us get together, no matter how long it has been since the previous time, it always seems like we pick right back up. Heading from the Phi Delt House, I continued south on Nueces until I hit MLK, headed east on MLK Blvd, made a left to head north on Guadalupe and made a right to head east on 21st St. The next stop is one of the best treasures of UT Austin, the Harry Ransom Humanities Research Center. This building houses rare books, documents, and other artifacts that are protected by the University of Texas at Austin. It was designed to give adequate storage space for acquired collections, yet protect them from the natural environment with limited light in the floors above the first two. It has a museum gallery showcasing different pieces of the archived collections, and has a great reading room for students to conduct research and study using the collections if needed. 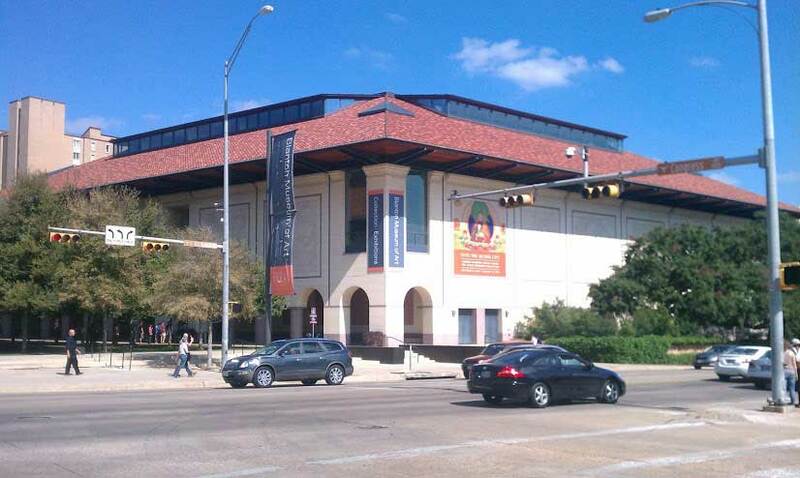 Some of the more notable things that are housed at the Harry Ransom Center are the first photograph in the world, the Gutenburg Bible, and costumes used in the film Gone With the Wind. At this place of history, I wanted to thank my grandparents and other extended family members such as aunts, uncles, and cousins. I was pretty lucky in having a family on both my parents’ sides that always made gatherings fun and joyful, yet shared history with us. My maternal grandparents are also great archivists of our family providing all of the grandchildren with copies of documents, photos, and stories to remember our family’s history as we forge the path ahead. Heading east on 21st, I stopped at Littlefield Fountain which was designed to represent the American Army and Navy being victorious coming home from World War I as well as a memorial to UT Austin students who served in World War I. 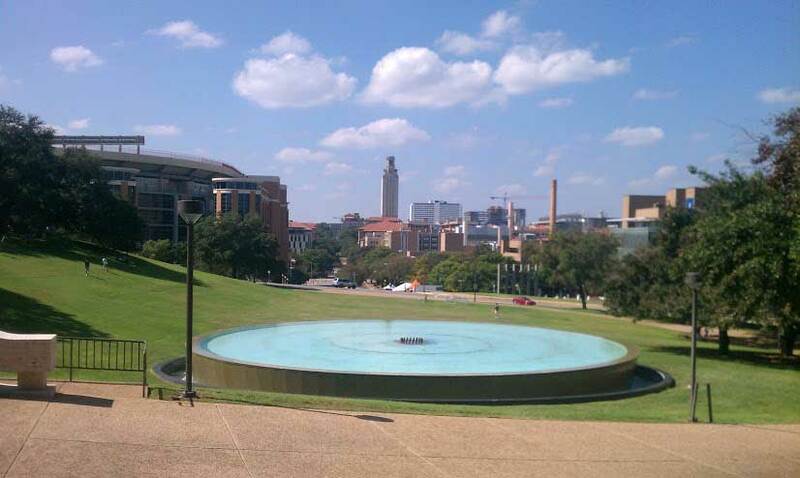 You cannot leave the campus at UT Austin as a student until you take a picture in front of the fountain with the Tower behind you. After a quick view, I kept going east towards the stadium. Campus has quite a bit of hills for runners going east to west on 21st, 24th, and Dean Keeton St. The largest hill on 21st is up ahead ending at the stadium at the bottom. I happen to take a quick shot at the top of the hill and then again at 21st and San Jacinto. It is quite a view looking straight up at the stadium from the bottom of the hill. From there, I turned left and headed north until I hit 23rd St. 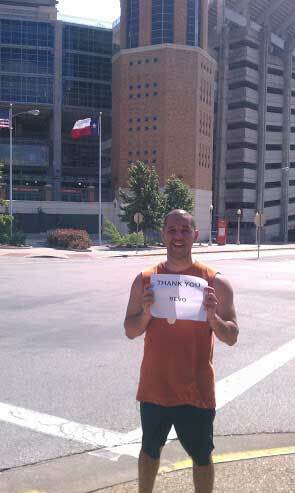 I stopped at San Jacinto and 23rd St at the northwest corner of the stadium. Darrell K. Royal – Texas Memorial Stadium is the home of the Texas Longhorns Football Team and one of the largest collegiate football venues in the U.S. One of the biggest benefits of going to a school like UT Austin is the culture of spirit, pride, and tradition that really connects you from the moment you step foot on the campus as a wide-eyed freshman or new grad student till your last breath on earth as an alum. The Saturdays in the fall semester on a home football gameday is unlike anything else that I have experienced in life. 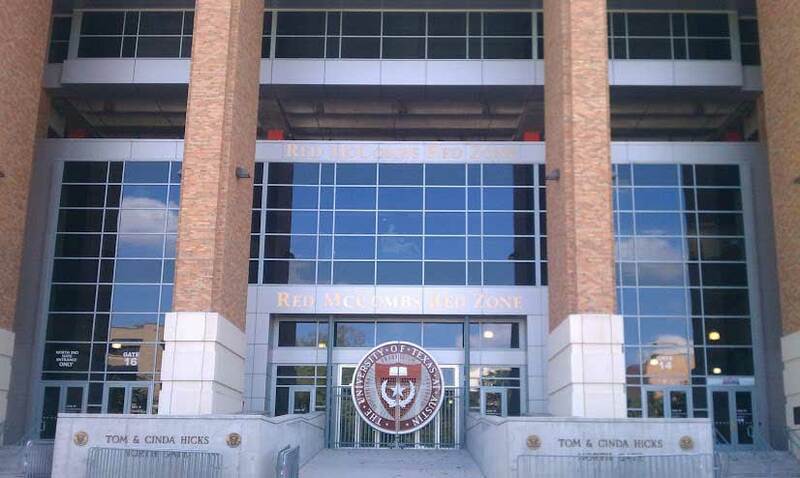 There are many aspects of the stadium that one has to experience including the museum about Bevo – the live Longhorn mascot, the Longhorns Limited Store, and the Red McCombs North End Zone food court which includes tables for studying, a decent sushi place and Starbucks. The stadium is also home to Belmont Hall, which houses one of the top departments of Kinesiology and Health Education in the country with exercise laboratories and even includes one of four gyms that are accessible to students, faculty, and staff. Above the food court, there is also the H.J Lutcher Stark Center for Physical Culture and Sports which houses a fantastic collection for fitness and health researchers and people who want to learn about the different aspects of sport within social sciences through exhibits. Here I would like to thank mascots, Bevo XIII and the current mascot, Bevo XIV. They are excellent live mascots that are great representatives of the University and I always enjoy seeing them at events. They are never fair-weathered fans and enjoy the football games rain or shine. As I headed towards the next stop, I continued east up 23rd St taking a picture of the North End Zone gate and the bottom and top of 23rd street, which is a hill itself. To get to the next stop, the LBJ Presidential Library and Museum, you have to cross this large lawn across the stadium where many students and visitors love picnicking, sliding down on a wet or snowy day (which is rare as Austin annual weather averages over 200+ days of sunshine a year), or studying. 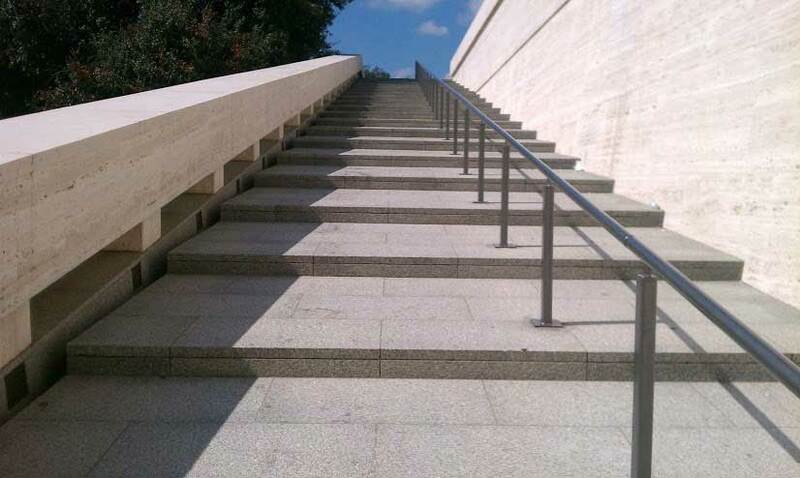 Once you cross the lawn, there are a good set of stairs to get to the actual library. 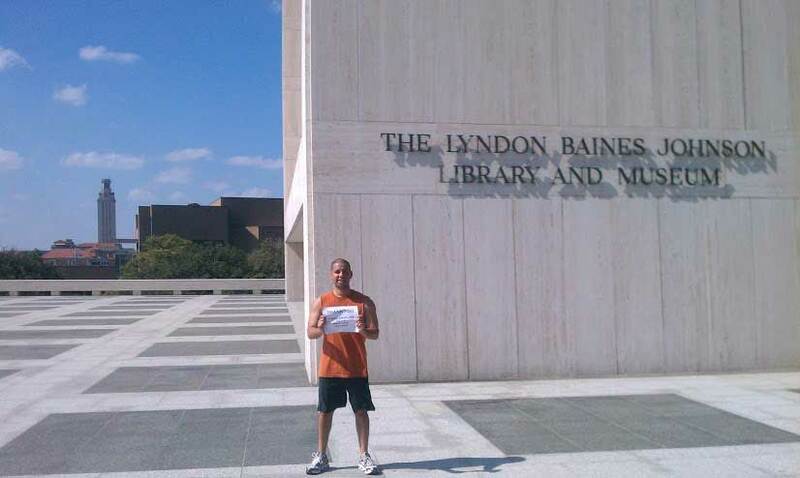 The Lyndon Baines Johnson Library and Museum is one of 13 Presidential Libraries administered by the National Archives and Records Administration. Inside there are 45 million pages of historical documents, 650,000 photos and 5,000 hours of recordings from President Johnson’s political career archived. I have been through the museum several times which includes a presidential limousine and a replica of the Oval Office in the LBJ era as well as political videos and recordings you can hear from the 1960s, a very turbulent era of American history. Here I would like to thank Earnest Colvin III and Ken Polito, two significant teachers from my high school years. These two men have a profound effect in the way I see things in life and how I attack tasks and objectives at hand. Even though I had great professors at UT Austin in undergraduate and grad school, I miss the memorable lectures from Mr. Colvin and Mr. Polito whether they were in the context of music or British literature. They forced me to really work hard and prepared me well for higher education and the world. I also want to take the time to thank all of the teachers I had in high school. I know teaching adolescents is not easy, and from what I experience indirectly with high school students today from observations in classrooms and visiting high school campuses to recruit for UT Austin, I can imagine that teaching in high school today has become even more complex than the late 1990s. Kudos to those in the profession! From the LBJ library, I continued southwest going by the east side of the stadium and into some parking lots till I hit the corner of Red River and MLK Blvd. 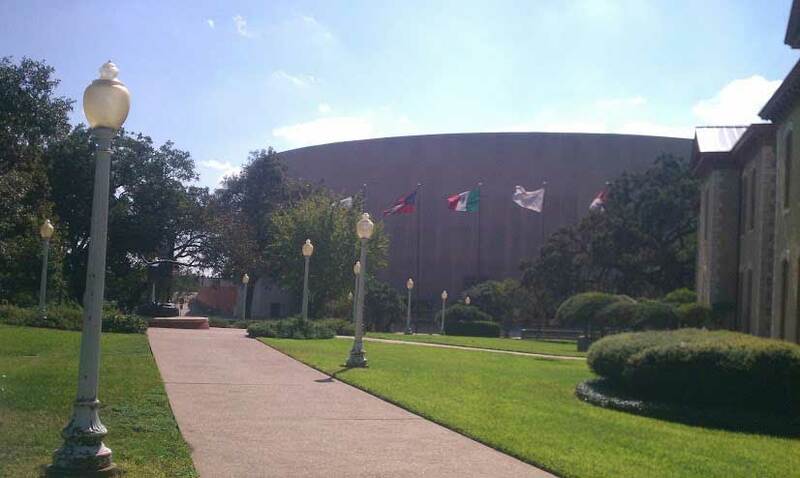 Once I crossed over MLK, I decided to take a quick snap shot of the Frank Erwin Center which has the six flags of Texas in front representing the six sovereignties that governed Texas in its history. The Frank Erwin Center is the home to Texas Longhorns Basketball and is a main concert venue for artists and special events in the city of Austin. From here, I headed down the hill on MLK several blocks until I hit my next stop at the bottom of the hill. At the bottom of the hill at MLK and Congress, there are several things to note. The Blanton Museum of Art is an excellent art museum in Austin that has the largest art collection in Central Texas. For you art lovers, it is a great place to check out. Catty-corner to the Blanton is the Bob Bullock Texas State History Museum. 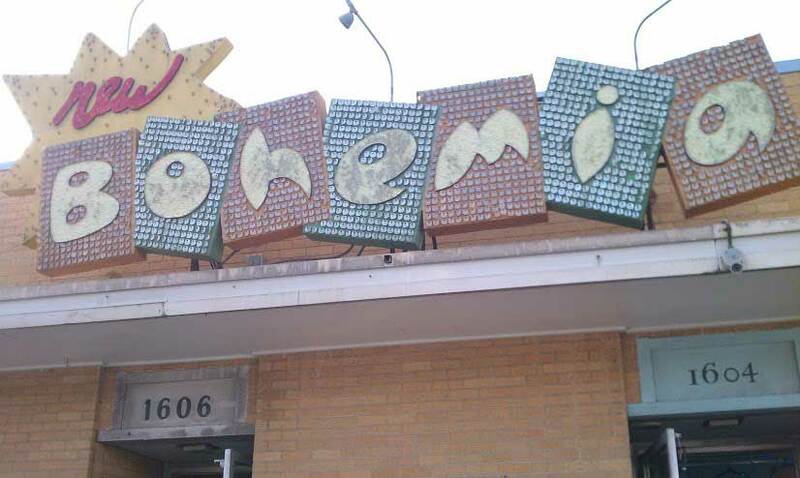 This place is great for a non-Texan to learn about the history and culture of Texas. I enjoy the IMAX theatre inside as it does show IMAX mainstream movies as well great films on aspects of the state. One of the best seasonal exhibits that they did so far was about the “Friday Night Lights” culture in Texas and the impacts of high school football throughout the state. 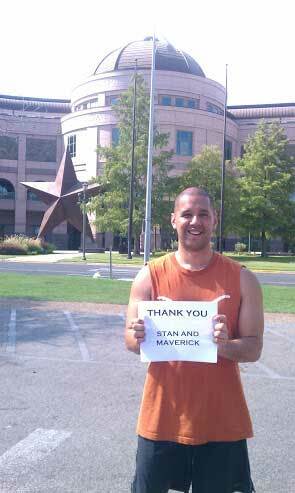 Here I wanted to thank Stan and Maverick, two Austinites that are a big part of my life whom I lived with from 2006-2010 in the central east side of town. They are polar opposites in a lot of ways, and their perspectives could not be more different. They were a big part of life through my grad school years, and I appreciate their wisdom and insight. From here, I am heading south on Congress towards the Capitol. The Capitol grounds is a great scenic trail with many pathways and small hills around the perimeter and within the Capitol fence. Monuments and statues can be found around the Capitol building as well. The grounds constitute about 22 acres around the building. On this particular day, there were a good amount of runners, people enjoying the weather with picnics, people reading and studying and tourists. 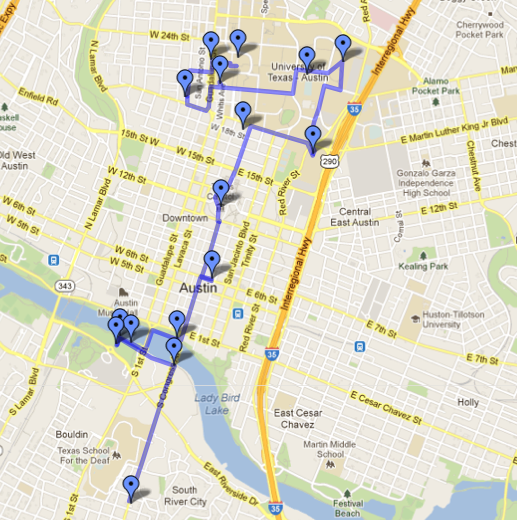 Most runners in Austin use the grounds to cross through one side of downtown to the other without consistently staying in them, but it is possible to loop around. 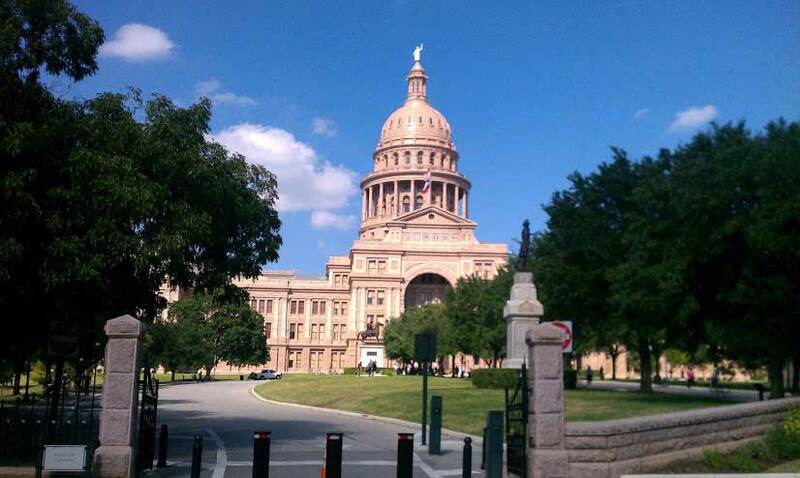 There are many things one can do inside the Capitol building including visiting Texas legislative representatives, legislative chambers, and the historical artifacts within. Texas’ state legislative sessions are on every odd numbered year between Jan – May, and sometimes they will have special sessions. There was a political rally going on this day with speakers speaking on topics like the pro-choice abortion stance and women’s rights as I was running around the northern façade to the southern façade. 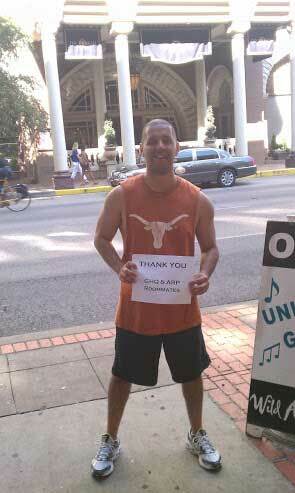 Here I would like to thank my past and present colleagues within the Office of Admissions at UT Austin. This organization employed me as an office assistant/tour guide when I was an undergraduate student and I have been with them since 2006 as a full-time professional upon my return from Ohio. I am proud to be affiliated with such a strong organization who embraces opportunity, professional development, and integrity. I consider them a leader and visionary in the world of U.S. higher education admissions. As you can see, the majority of the rest of the route is concentrated south on Congress Ave.
As I headed south on Congress Ave, there was quite a bit of hustle and bustle. This particular weekend was within the multi-day Austin Film Festival, and so there were several movie buffs, critics, and filmmakers in town walking around to different venues to view films being presented. 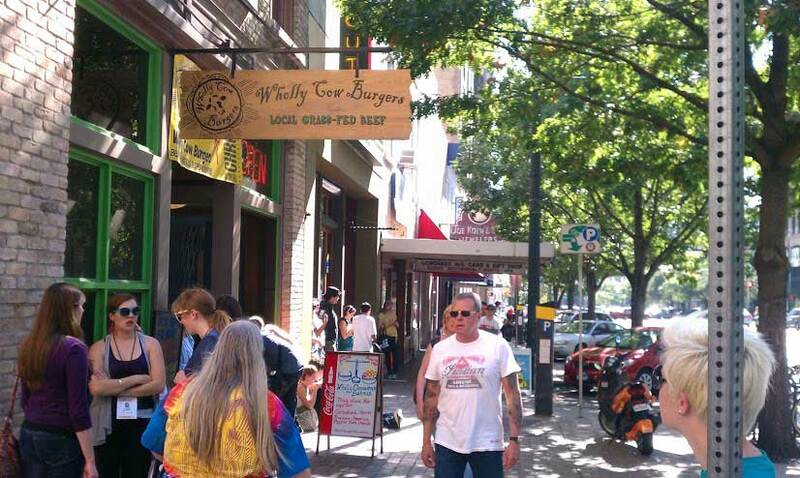 I also happen to pass by some cool local eating places like Wholly Cow Burgers which specializes in beef from local grass-fed cows and Kebabilicious. One of the coolest things about Austin is that the restaurants and places to eat around the middle of the city tend to be local. While Austin does have its pockets of national chain places, there are so many local businesses that have thrived here and Austin continues to be a place to cater to small restaurant owners looking to bring a fresh experience to our palettes. When I arrived at the 6th St and Congress intersection, I headed east on 6th for a few blocks and stopped at the Driskill Hotel. It is a historic hotel built as a showplace by cattle baron Jesse Driskill in 1886. It has the coolest lobby with its pillars and marble floors exemplifying historic luxury. The lobby was filled with Austin Film Festival participants just enjoying the scenery before heading to another film showing. Here I want to thank the staff at the General Headquarters of Phi Delta Theta and the fraternity brothers from all over the country that I lived with while residing in the Arthur R. Priest house while I was employed in Oxford, Ohio with the international office. One of the roommates is the man behind this project, Steve Good which is where our paths crossed. 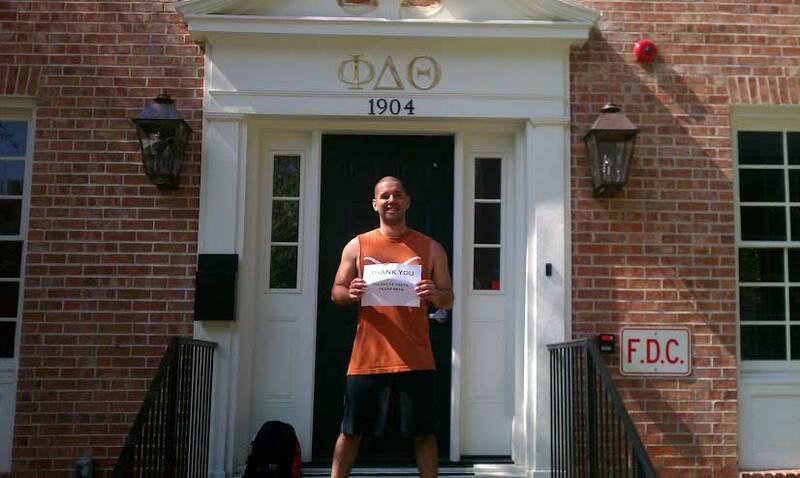 I left Austin in 2004 where I had the distinct opportunity and privilege to be employed by Phi Delta Theta and travel the country as a leadership consultant for two years. All of my roommates and I traveled all over the U.S. and Canada for a solid nine months out of the year. Staying in hotels, packing and unpacking suitcases, flying, going through airports, and driving miles on end on interstate highways was the norm. We became true road warriors and expert travelers while seeing so much of the U.S. and a variety of colleges/universities. Having six other roommates where we all worked together had its ups and downs, but they were my family in my time away from Texas. 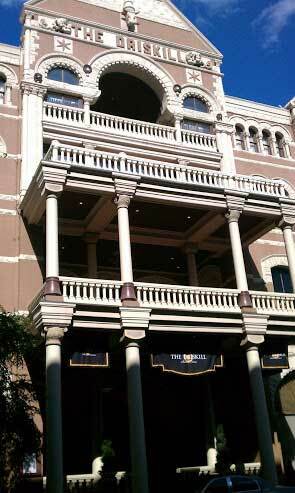 East from the Driskill Hotel is the gateway to Sixth Street, one of Austin’s historic and entertainment districts with restaurants, bars and live music venues. If you are a nightlife enthusiast, you will love the entertainment districts in Austin as there are always events, concerts, great restaurants, and venues ranging from chill lounges, to venues with dance floors or stages, sports bars, biker bars, pubs, and boisterous college bars. Besides Sixth Street, I also recommend checking out the West Sixth Street District, Red River District, and the Warehouse District. You can get to these different pockets easily through one of hundreds of pedicabs. But be careful, hopefully A) the pedicab driver put on deodorant and reapplies it throughout the night and B) you are not traveling downwind to catch a whiff in case he or she (yes, I said she) does not. LOL! They are actually hilarious and pretty cool folk to chat with. I went back west on 6th back to Congress and then South to the entrance of Lady Bird Lake Trail. 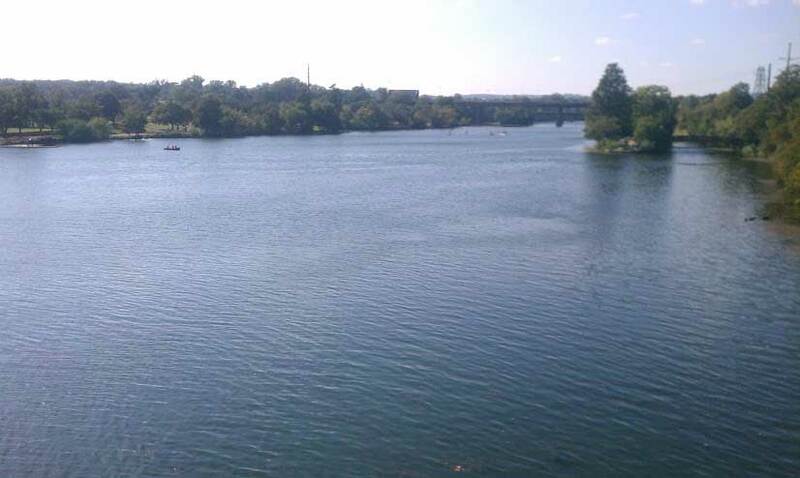 Lady Bird Lake Trail is one of the most popular running areas in Austin. Several downtown hotels on both sides of the trail connect directly to it for non-Austinite runners (Hyatt, Four Seasons, Radisson). I entered into the trail at Congress Street. Extreme long distance runners can go quite a ways as the trail is 10.1 miles long and mostly flat, with 97.5% of it at less than an 8% grade. Lots of people also bike or just walk, but you will find people running at all hours of the day. Therefore, if you do not want to run on any hills throughout Austin and campus, you can just come down to the trail and run a few miles. 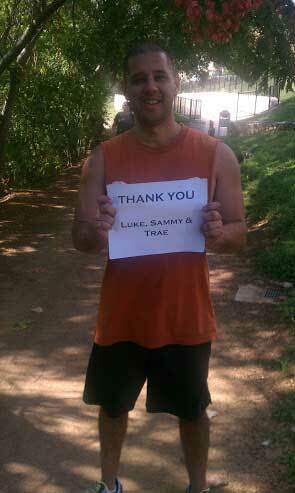 I wanted to take some time to thank Luke, Sammy, and Trae, my best friends from high school back in Fort Worth. Even though we took different paths from high school, they have been great friends throughout the years. I have some great memories from the times we traveled to Seattle, Los Angeles, and New York City or just hanging out at someone’s house in Fort Worth. 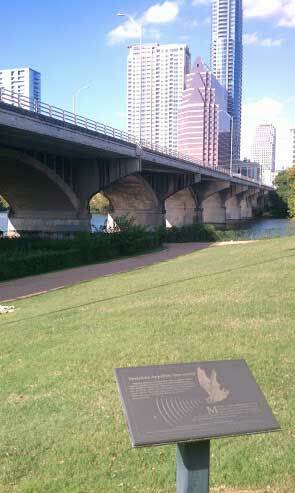 From here, I took the pedestrian bridge at S. 1st Street and crossed over Lady Bird Lake to the south side of the trail. When I got down from the stairs, I headed west a bit to hit a few major stops. 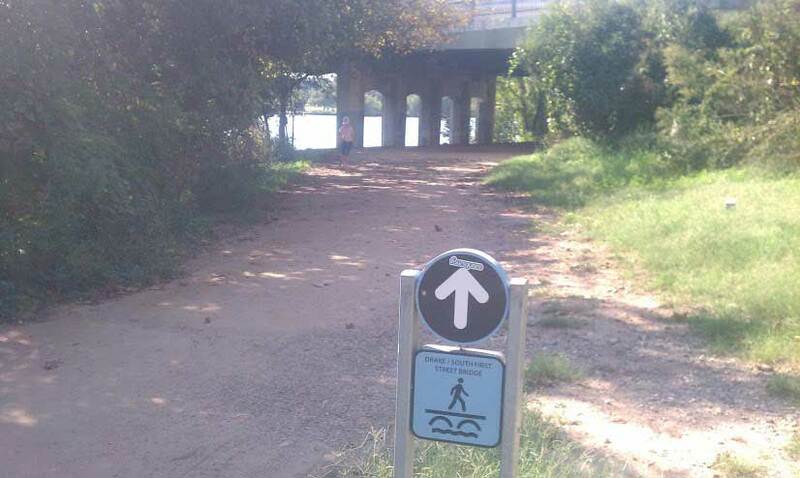 Right when you get off of the pedestrian bridge, there is something that you will see at several areas of the trail, which are free water coolers that are provided every day at certain points on Lady Bird Lake from private donations and employees from running store businesses like Run-Tex (MoPac and Audtorium Shores), Rogue Running (I-35/Riverside) or Luke’s Locker (near Lamar and Lady Bird Lake – north shore). I think that says a lot about how local businesses treat the customer base in Austin. Also in this area, there is a great pavilion with a great shot of downtown Austin in the background looking north. Heading west on the trail, you will pass several areas where people can exercise on pull up bars, dip bars, or stretch. You can also find benches around the trail to enjoy scenic spots of Austin. 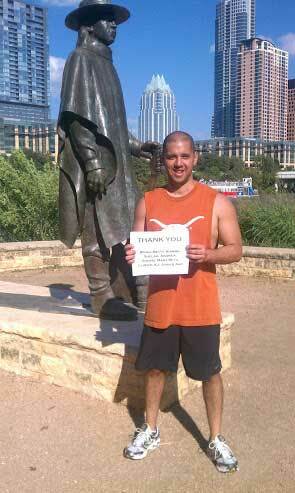 This next stop is at the Stevie Ray Vaughan statue at Auditorium Shores. Throughout the year, bands and music festivals will set up at Auditorium Shores, which is a large grassy field with Lady Bird Lake and downtown Austin as a setting. Stevie Ray Vaughan, a musician who broke out in Austin, Texas in the 1970s and found national fame in the live music venues in Austin, represents the music community that makes Austin “The Live Music Capital of the World” since the time Vaughan passed away in 1990. There are hundreds of live music venues in Austin that one can enjoy anytime of the week of any genre. Though Vaughan was known for being an excellent guitarist in the blues genre, Austin has festivals for pachanga, country music, hip-hop, salsa, folk, bluegrass, and other genres from different cultures. Two large music festivals that bring national attention to Austin are South by Southwest and the Austin City Limits Festival. Besides the environment and venues for musicians, a great non-profit in Austin called the Austin Music Foundation advocates for the music community, helps local musicians thrive, and keeps creative options for the community alive and well. Here, I would like to thank the student affairs staff at UT Austin whose advising affected me to go into this career and helped me to navigate my passions towards higher education. Thanks Brian, Betty Jeanne, Shelah, Andrea, Sherri, Mary Beth, Christi, Kristen, John, and Amy for being great professional advisors and mentors. 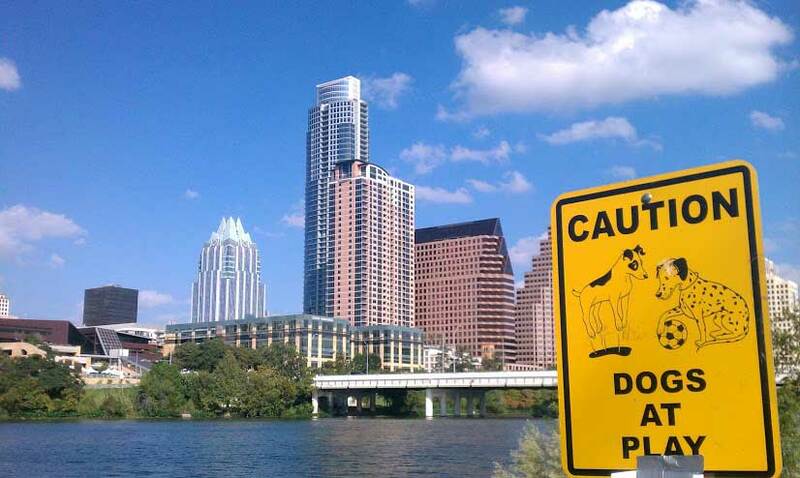 Besides music, something else about Austin is that the city considers pets in Austin as valuable family members. DogFriendly.com ranked Austin as the #7 place to take your dog on vacation. There are about 14 dog parks spread all over the city and plenty of businesses cater to dog boarding, grooming, and dog fashion. Back in 2007, Men’s Health also ranked Austin #7 dog-friendliest city in the U.S. One of the large dog parks is on Lady Bird Lake Trail as part of Auditorium Shores. Many of the running events in Austin allow dogs including an annual Dog Walk. Also plenty of restaurants in the city, particularly restaurant patios and food trailer parks allow dogs. These establishments have free dog bowls for food and water on hot days, and plenty of the public fountains in the city have lower spouts for dogs and dog bowls. One of my favorite places to stop on the Trail is along the leash-free area to watch dogs play, swim, and fetch things. 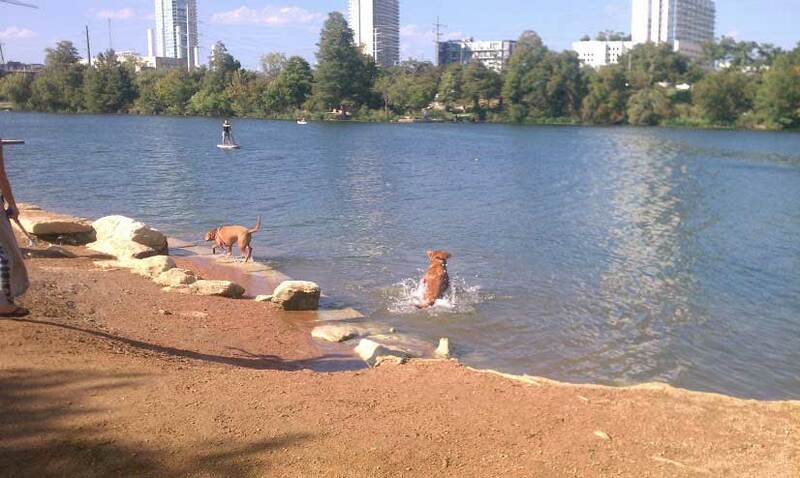 I stopped to take a few shots of the dogs fetching tennis balls in Lady Bird Lake before heading East. 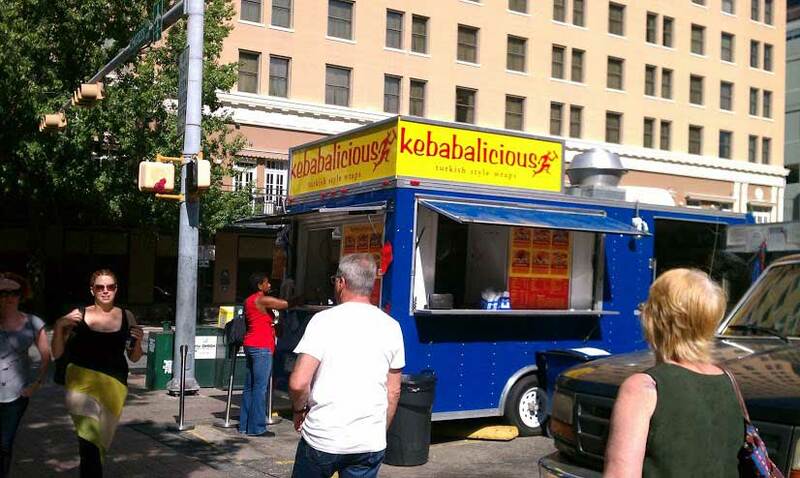 My next stop is back on S. Congress on the south side of Lady Bird Lake. In the late spring and summer, when sunset comes, over 1.5 Mexican free-tail bats million bats come out from under the bridge at S. Congress to fly out to feed on millions of insects. When you go under the bridge on the south bank of trail, you can definitely smell the bats and hear them squeaking through the crevices of the bridge where they live and sleep in the day. There is also a bat observation area and a small exhibit on the bats for visitors on the southern east side of the S. Congress bridge on the trail. While most people watch the bats from the bridge above, you can also take a riverboat cruise to watch the bats fly out above you from the water. However, if you are going to do this, make sure you have a hat and are covered as the bats usually go to the bathroom from sleeping all day and people on the river and on the banks tend to be direct targets. Austinites love these seasonal warm weathered flying mammals for their natural beauty in their nightly departure and for keeping all the population of Texas insects under control like pesky, blood-sucking mosquitoes. In fact, Austin has a Bat Fest at the end of the summer to celebrate the Bat. When I’ve gone in the past, I’ve seen several people dressed up like vampires, Batman, and actual Batmobiles. Here, I wanted to thank Elton, John, and Jose who are my closest friends in Longview for their friendship and camaraderie and for teaching me about East Texas. Moving out to East Texas, it was not easy at first to transition from Austin life, but after meeting these guys and other people, it became much easier. Looking south, from the end of the bridge, you have about one good mile and another hill to climb until the end of this route. At the top you will come to the neighborhood of South Congress Avenue District or SoCo as Austinites refer to the area. The motto of the city of Austin is “Keep Austin Weird” and this motto is very prevalent in SoCo. There are a lot of really cool eclectic and eccentric dives, vintage shops, and some fantastic restaurants like Magnolia Café, Doc’s, Guero’s Taco Bar, or The Woodland. 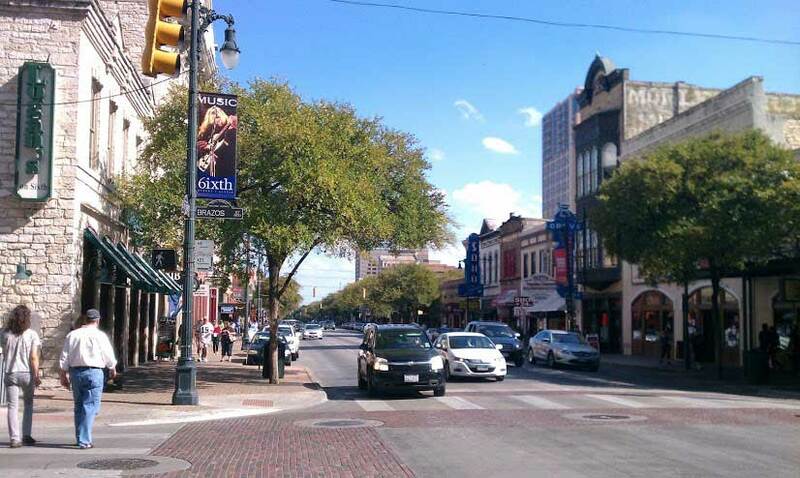 One of the most popular things to do in Austin is First Thursday, which is a monthly block party highlighting SoCo. Many stores give out free beverages and most hours are extended. SoCo is also a hotspot for celebrity sightings. Because of UT Austin’s excellent film school and laid-back culture, Austin is also a very popular place to film movies and TV shows. You can check out current film projects in Austin at the Texas Film Commission website. I have seen many a celebrity over the years hanging out in SoCo like Luke and Owen Wilson, Quentin Tarantino, and Vince Vaughan, particularly during SXSW. Right now, Natalie Portman and Ryan Gosling are in town filming a movie until November. 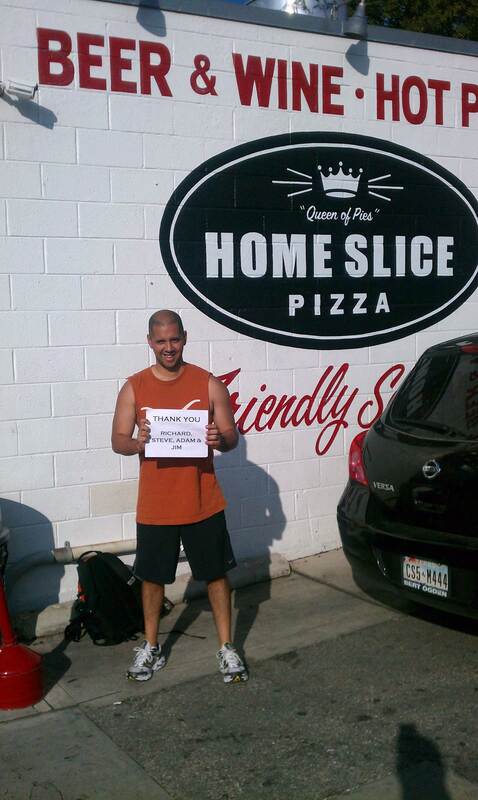 The last stop is at one of the most popular SoCo eateries, Homeslice Pizza, which is a New York Style pizza place that has both indoor and outdoor seating for people that want to people watch. 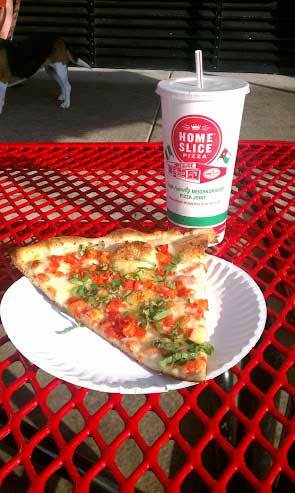 I had a fantastic piece of “Mahgerita Pizza” to load up on some carbs at the end of the run. Here, at the end, I wanted to thank some other friends (Richard, Adam, Jim, and Steve) who are strong confidants in my life and there to talk to whenever I find myself needing to gain another opinion on many areas of my life. Thanks for all of your insight and wisdom! Well, looks like the post is coming to a close. While I focused on this 6 mi route/trail going through UT Austin and Downtown/Congress Ave to hit some notable sites of Austin, there are definitely other running areas and hiking trails in the city like Brushy Creek Trail in NW Austin/Cedar Park, Shoal Creek Park west of downtown, Lamar Ave, Barton Creek Greenbelt, Zilker Park, and much more for the avid runner and dog companion. I had so much fun completing this project, and was so inspired by this blog, and the people I met that took my pictures (I did this project solo as I love meeting people and Texans are a friendly folk) that I decided that several non-profit groups will receive significant donations. 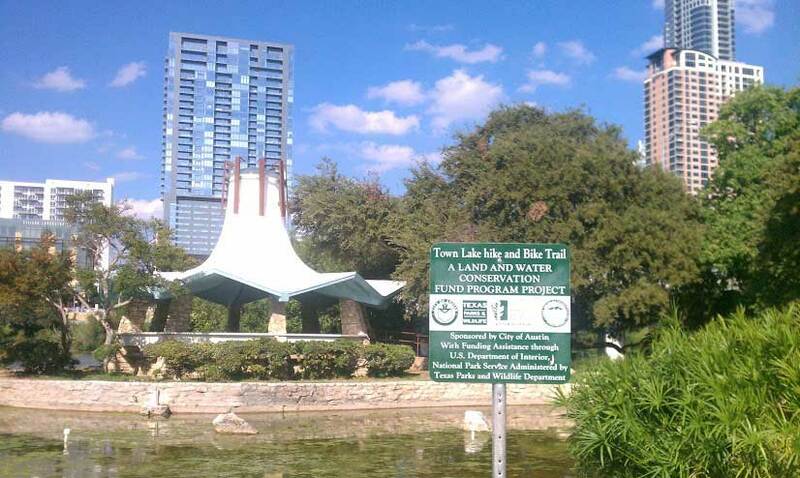 The non-profit groups that are receiving funds from this personal project are the Trail Foundation that maintains the amazing Lady Bird Lake Trail in the city, Austin Pets Alive which is a non-profit staffed by volunteers to eliminate killing companion animals, the UT Student Emergency Fund – a fund set aside to help UT Austin students through emergency situations, and the American Diabetes Association. I hope y’all get a chance to come on down to Austin, Texas and run the hills of the city and/or Lady Bird Lake Trail and then refuel with some Kerbey Lane Queso from Kerbey Lane Café, Franklin’s BBQ, or a Don Juan breakfast taco! I could continue and talk about Austin being a foodie town, but that is a whole other blog. Thanks Steve again for this fantastic idea! 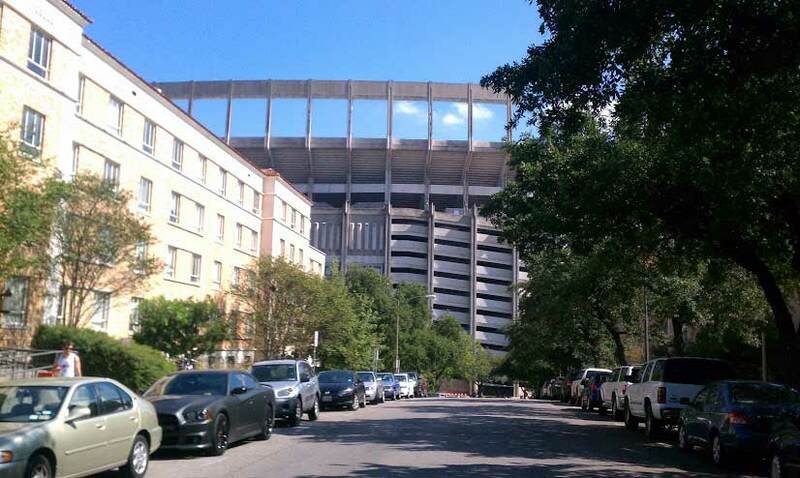 So long, farewell… The Austin hills are definitely alive down here with the sound of live music, running shoes, dogs, creative artists, and the Longhorn faithful! HOOK ‘EM HORNS! Wow! This is great Mario. You have captured both your personal life and the beautiful city of Austin in a very cool and unique way. Whoever reads this, will be inspired and encouraged to follow in your footsteps. Steps to a better healthy tomorrow and to a more creative lifestyle that you have shown through this blog. May you continue to have a great positive outlook in life. Hook’em Horns! are inundated with data which can be putting guests off. health care, it does not in any way mean that these courses are of any less importance.